There's a nutritious secret ingredient hidden in all of these delicious comfort foods. Thanksgiving is one of my favorite holidays because it combines three beloved “F” words — family, friends and, of course, food. In the spirit of its deliciousness, I’m sharing my top tips to keep from over indulging, along with creative ways to prepare a few festive favorites. Give these simple recipes a try: I promise they deliver on the amazing taste you and your guests know and love, while also providing way more nutrition than their original versions. 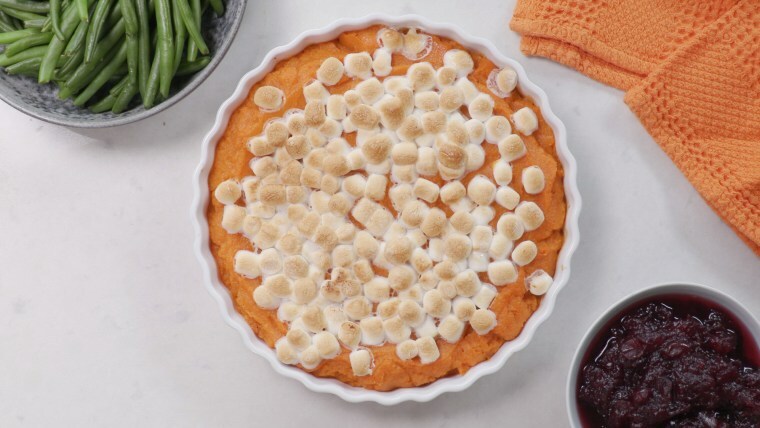 Plus, for my new digital show "Joy Full Eats," I'm showcasing a new twist on a holiday side that's so easy to make and versatile, you'll want to serve it all year long. Now, pass the Thanksgiving turkey! While you're at the table, press pause between bites to savor the delectable flavors of every dish and take a moment to converse with dear family and friends. This will help slow down your eating pace while allowing you to pay attention to hunger cues. And, of course, you'll be able to take advantage of having great conversation with loved ones. 2. Follow my "Rule of One." Before the big meal, stick to just trying one of each of the hors d’oeuvres being served. At Thanksgiving dinner, fill one dinner plate with whatever looks the most yummy, keeping in mind that smaller portions allow you to sample more sides. When drinking, have plenty of water and stick to enjoying just one alcoholic drink throughout the meal. And for dessert? Pick one of your favorite sweet treats (or a sliver of two, if you really can’t decide!). If you’re torn between pumpkin, apple or pecan pie, choose pumpkin because it's usually one of the lightest and less caloric Thanksgiving desserts. 3. Prepare one of my truly Joy Full recipes! Swedish Meatballs: In addition to the typical holiday favorites, my family always has this classic comfort food on our holiday table! It’s easy to understand why everyone goes crazy for this dish, too. The mini meatballs are flavored with allspice (so named because it’s like a mix of nutmeg, cinnamon and clove) and then smothered in a scrumptious gravy. My version incorporates a few clever tricks to trim the calories and boost nutrition. Grab a toothpick and dig in!​ Get the recipe here. Butternut Squash-Apple Soup: Sweet apples take a savory turn in this cozy, festive soup. Butternut squash also provides a blast of beta carotene for radiant skin, healthy joints and sharp vision. As the weather turns cooler, this dish has the perfect pairing of in-season produce — sweet fruit with deliciously nutty vegetables. Get the recipe here. Pumpkin Ice Cream: Why should all pumpkin-flavored foods be served hot and in a mug? Time to break the rules. Whip up this sweet “nice” cream (i.e. it's dairy free) for a fantastic treat that can be enjoyed any time of year — but it's especially great around Thanksgiving. Just open up a can of pumpkin puree and voila, you have an amazing dessert that packs in a great punch of nutrition and isn't overly sweet. Get the recipe here. 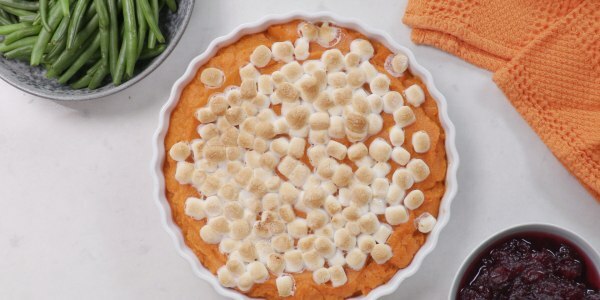 Sweet Potato Casserole: ​Your family is going to flip for this nutritious spin on a Thanksgiving classic. I snuck in a secret ingredient that drives down both the calories and and carbs without sacrificing any of the tastiness — or changing the vibrant color of the dish! You can top it with marshmallows but you can also add toasted pecans for a deliciously crunchy texture. For more healthy tips, follow Joy on Instagram, Facebook, Twitter, and check out her newest book “Joy’s Simple Food Remedies."